One feature you’ll find in our home, particularly during the winter months, is a card table in the family room which features an ongoing jigsaw puzzle. My wife and I both work on it here and there and our oldest child will occasionally do a bit of sorting pieces by color. Last night, I started a 1,000 piece puzzle of Georges Seurat’s famous painting A Sunday Afternoon on the Island of La Grande Jatte. Just as I was starting to fit the border of the puzzle together, I had a revelation. This is a really frugal activity. I should write about it on The Simple Dollar. I’ve been a jigsaw puzzle solver since I was very young, watching my father put them together when I was three or four years old. A big part of winter for me is getting the card table out and assembling a few puzzles, since the peak of winter usually involves darkness descending by about 4:30 PM and temperatures below zero. It’s a perfect evening activity. There are several big things that jigsaws have going for them. They’re inexpensive. 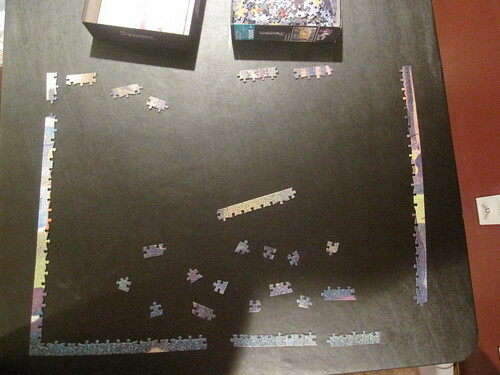 If you finish a jigsaw puzzle that you bought new, you’ve spent about $0.50 per hour of entertainment. That’s based on the typical price of new jigsaws and my typical speed at solving them. If you add on top of that the ability to trade them to others once you’ve finished one (and taken the requisite digital picture of the completed puzzle), then the cost gets much lower per hour of entertainment. They help me to appreciate art. My favorite puzzles are those of great paintings because the nature of the jigsaw puzzle forces you to examine the art very closely, noticing and appreciating little details that you might never notice without such an intense focus. This is why, for example, I am doing Seurat’s A Sunday Afternoon on the Island of La Grande Jatte – I’m learning a great deal about some of the technical elements of pointillism as an art style. They teach me patience. A large puzzle with 1,000 or more pieces is an exercise in patience. Sorting the pieces, finding matches, and slowly building the image takes a great deal of time. A person can sit there for an hour and only get a piece or two. Completing such a puzzle requires significant diligence. It also forces you to slow down and focus, a skill that’s becoming increasingly valuable in a distraction-filled world. They give me opportunities to teach my children about art – and about patience. A puzzle is a great learning opportunity. Not only am I helping my children to learn about pattern matching, sorting, and other such skills, I can also teach them about art. Along the way, they’re also learning patience and learning that something worthwhile doesn’t have to be done in a few minutes. It’s worthwhile to note that I often use the same exact setup to play solo games and puzzles. Several of the board games I own also function quite well as solitaire games, plus there are countless solitaire games that can be played with a pack of cards. In both of these cases, I’m simply squeezing more value from something I already have on hand while also stretching my mind. Start a jigsaw puzzle this weekend. Challenge yourself to finish it. See if you can put some pieces together without getting distracted. Exercising your focus will help you in all kinds of life avenues, plus you just might find that you’re entertained as well.